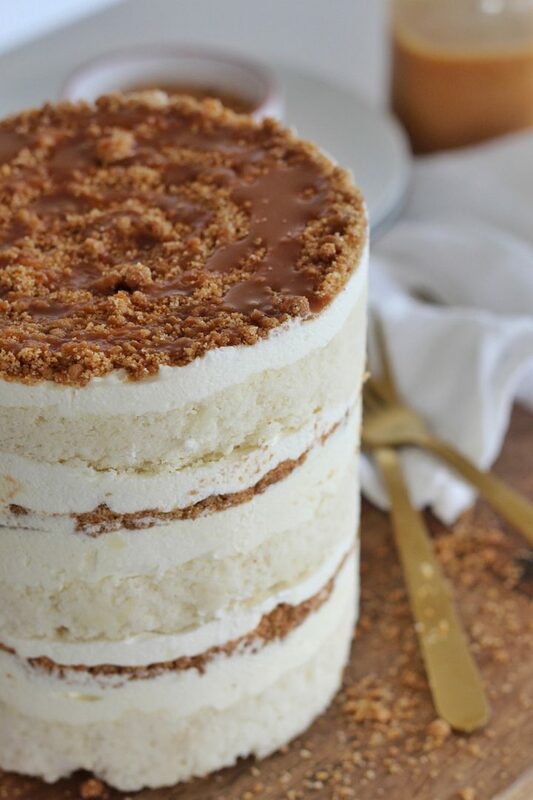 Banana Cream Cake – Light and fluffy white cake layers with banana cream filling, toasted graham crackers, whipped cream and salted caramel. My Banana Cream Cake is inspired by the popular Magnolia Bakery banana cream pudding and stacked like my favorite Milk Bar Cakes. If you’ve had Magnolia Bakery’s banana cream pie, you probably dream about it often like I do! It’s one of my favorite New York City treats. There’s a couple reasons I choose to stack a cake Milk Bar style. The first being that it has a lot of elements in it (like my Tonight Show Cake) and the acetate paper will better support the cake. The second being that it has softer fillings that won’t hold up as well with a coat of frosting around them. Another Milk Bar inspired element of this cake is the banana milk soak. Adding a little extra moisture to a naked cake is never a bad idea since these types of cakes don’t have a layer of frosting to protest the cake from drying out. And more importantly, this step adds even more flavor to the cake. You can’t go wrong with a soak! 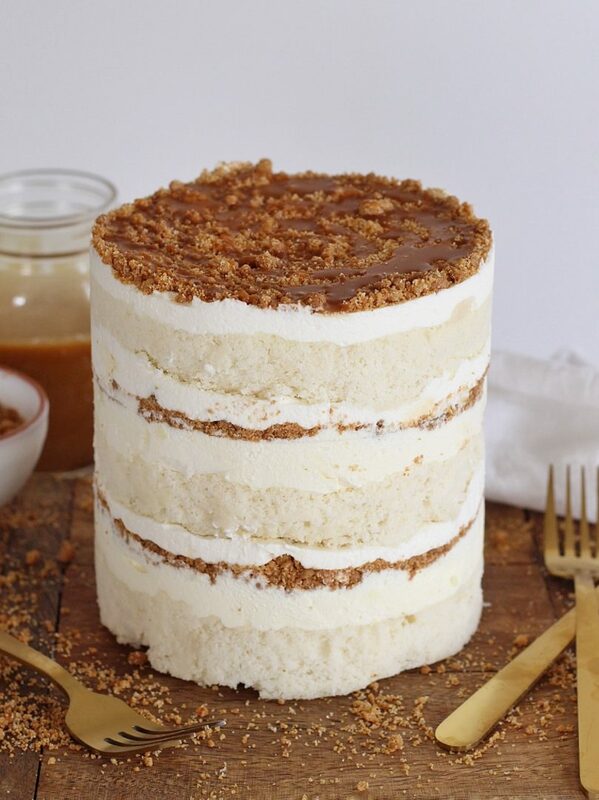 Also layered in this cake: toasted graham cracker crumbs, salted caramel, and fresh whipped cream. Basically heaven in a cake. You can also add in fresh sliced bananas if you plan to serve the cake that same day. Oh, and one little note about serving this beauty – serve it cold, or things will get pretty messy when you’re cutting the cake. Light and fluffy white cake layers with banana cream filling, toasted graham crackers, whipped cream and salted caramel. Preheat the oven to 325 degrees F. Coat a half sheet baking pan with nonstick spray, line it with parchment paper and spray again. Mix the flour, salt and baking powder in a large bowl. Set aside. In a bowl of a standing mixer fitted with the paddle attachment, beat the butter, oil and granulated sugar together until light and fluffy. Add the egg whites, one at a time, beating well after each addition. Add the vanilla. With the mixer on low speed, beat in the flour mixture and buttermilk alternately, beginning and ending with the flour. Scrape down the bowl and mix until incorporated. Bake for 20 minutes, and then test to see if it's done using a toothpick inserted into the center of the pan. Only a few crumbs should be one the toothpick. May need to cook it for an additional 3-5 minutes, depending on your oven. Mix the pudding mix, sweetened condensed milk and milk in a bowl until well blended, about two minutes. Transfer the mixture to a shallow dish, cover, and refrigerate until set, at least 2 hours. Whip the heavy cream until stiff peaks form. When the pudding is set, fold it into the whipped cream in small batches. Carefully fold in all of the pudding until it is completely blended with the cream. Cover and refrigerate until you're ready to build the cake. This step can be done a couple days in advance. Combine the pudding mix and milk in a bowl and blend. Mixture should be thin, like milk. Best to make right before assembly. Mix the water, corn syrup and granulated sugar together in a very small saucepan. Bring the mixture to a boil over medium heat, but do not stir. Cook until the mixture caramelizes into the beautiful golden brown color. It happens quickly once the sugar starts browning, so don't walk away from the stove during this step. Remove the caramelized sugar syrup from the heat and mix in the cream. If the cream is not room temperature, add it SLOWLY, while mixing. Add a bit more and mix that in. Continue mixing in the cream a little bit at a time at first, and then you can start adding more and more as you go along. Mix in the salt and vanilla extract. Stir to combine. Set the caramel aside and let it cool completely before using, or store it in an air-tight container until ready to use. Crush the graham crackers in a food processor or by hand. Add the crumbs, sugar and salt in a bowl and whisk to combine. Add the melted butter and stir until all the crumbs are wet. Spread evenly on a baking sheet lined with parchment paper and bake for 15 minutes. Let cool completely and set aside. In a bowl of a standing mixer fitted with the whisk attachment, combine the cream and sugar. Whisk until stiff peaks form. Place a piece of parchment paper on the counter. Invert the cake onto it and peel off the parchment from the bottom of the cake. Use a 6" cake ring to stamp 3 circles in the cake (or two circles and two halves). Place the cleaned cake ring on the center of a sheet pan lined with parchment paper. Use one strip of acetate paper to line the inside of the cake ring. Put one layer of the cake (or two halves) inside the ring. Dunk a pastry brush in the banana milk soak and slather it on the cake, giving it a nice milk bath. Spread one-third of the banana cream pudding in an even layer over the cake. Spread sliced bananas evenly over the pudding (if using). Sprinkle 1/2 cup of the toasted graham cracker crumbs on top of the bananas, followed by a heavy drizzle of the salted caramel. Carefully spread about 1/2 cup of the whipping cream on top. Gently tuck in another strip of the acetate paper between the cake ring and the top quarter inch of the first acetate strip, high enough to support the height of the finished cake. Set a cake round on top of the whipped cream and repeat steps 4-8. Set the final cake layer onto the whipped cream and cover the top of the cake with the remaining banana cream pudding. 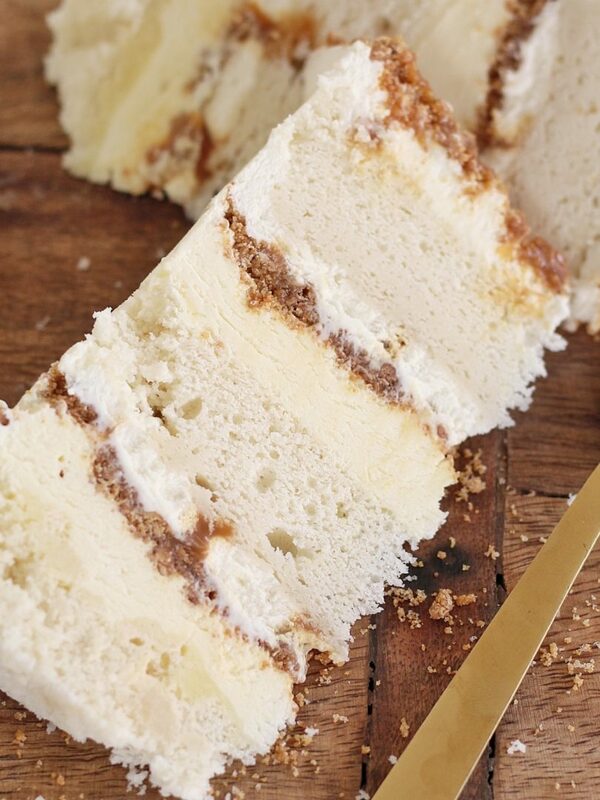 Sprinkle it with graham cracker crumbs, drizzle with salted caramel and decorate with whipped cream. Transfer the sheet pan to the freezer and freeze for at least 12 hours. About 4-5 hours before you're ready to serve, remove the cake from the freezer and transfer to the refrigerator to finish thawing. This sounds amazing! I’m a big fan of your work so when I saw that you had a blog & shared your recipes; and even more exciting for me, your thought process behind flavor creations! I’m also super excited to try your Red Velvet recipe! I have had the emulsion but I haven’t had a chance to use it. Thanks for sharing so much! Adore your work and style! Thank you! I love the vanilla cake I used in my Marshmallow Moon cake. It’s tender and flavorful. 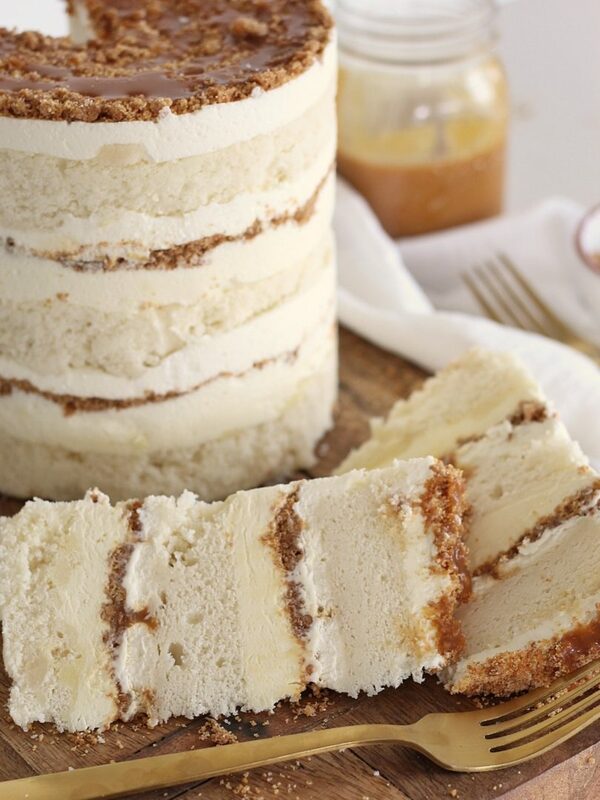 To make three 8-inch cake layers with that recipe, just double it. Hello! I would like to know what type of cream should be used to make the salted caramel. Thank you. Hi! I love your recipes, and this one called my attention right away! I wanted to know what to do if banana pudding mix isn’t available (it doesn’t exist where i live). Can i replace it with anything else? Best wishes and keep up the great baking! You can actually make homemade pudding and use banana flavoring. I’m sure Pinterest or Google has a good recipe. Thank you for sharing the recipe. I’m excited to put it all together. Can you clarify how much is 1.5oz of pudding mix? I bought 170g box. It’s half of one of the small boxes of pudding. Where in store would I find an acetate sheet like you used? This sounds like it’d be great for my kids’ birthday party in a couple of weeks. The only store locally here in Utah that carries acetate strips is Orson Gygi. If you aren’t local, your best bet it amazon. when do you remove the acetate sheet liner from the cake….after freezing it for 12 hours or do you wait until another 4-5 hours or right before serving the cake? I do it right before serving. I want to make this cake using cake pans, would that work? And do you think I could frost it with a buttercream? I’m just worried that the whipped cream layer would make it unstable because I don’t think I could freeze it with the buttercream, or could I? Is freezing the cake whole necessary for stability? Flavor? That’s a typo – no vinegar at all.